This recipe did end up making it onto the 21 Gluten Free Meals from Costco Plan…so please note the following: Because there are many potatoes in the plan, feel free to substitute mashed potatoes for sweet potatoes. Also, if you don’t have orange juice on hand, you could make these Brown Sugar Balsamic pork chops in place of these Orange Glazed Pork Chops. Make whatever you have on hand work for you! Y’all, I wasn’t going to share this recipe until next week. Then a coupon for orange juice came out, so I did all kinds of rearranging, quick photo editing and last minute blog posting to get this out to you. Because I love when you can save on specific ingredients. And I love how coupons can help you save big on your grocery bill. DELICIOUS pork chops. But in order for them to be delicious and perfectly tender, you HAVE TO marinate them in the orange juice for a couple of hours. The acid helps breakdown the meat, making it more tender…then cooking it, almost steaming it, adds to the tenderness. This similar pork roast recipe is also delicioso…Slow Cooker Peach Glazed Pork Roast. You could use orange marmalade instead of peach preserves, or apricot preserves would be great too…endless possibilities. (Except I wouldn’t use strawberry jam, or blueberry jam.) So maybe not, endless. Marinate the pork chops in a plastic bag of baking dish in the orange juice. Start steam-baking the sweet potatoes. Then pour the pork chops and the orange juice “marinade” into a large skillet. Turn heat on and bring the juice to boiling. Sprinkle cinnamon, ginger, salt and pepper to the top side of the pork chops. Cover and reduce heat to medium and cook for about 6 minutes. Then flip the pork chops over, season the other side with the same spices, and put the cover back on and cook until the pork chops are cooking through, another 6 to 8 minutes. Cooking time may vary depending on thickness of the pork chops. If all the juice boils off, add a little water to prevent burning. Once the sweet potatoes have cooked through, remove the skin carefully and mash in a mixing bowl with the butter and cinnamon. Prepare other veggies as directed. 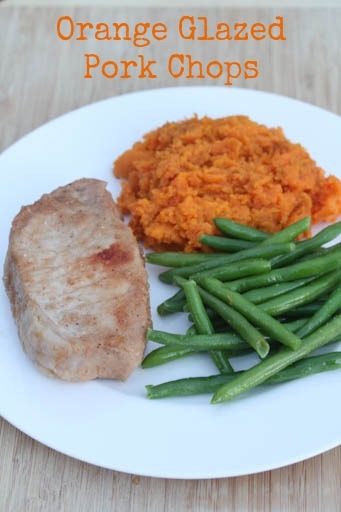 Serve Orange Glazed Pork Chops with sweet potatoes and veggies. FREEZER INSTRUCTIONS: Add the 4 pork chops along with the orange juice, cinnamon and ginger into a plastic freezer baggie. Freeze in the marinade. To cook, thaw in the refrigerator overnight and then cook as directed above. Tropicana OJ in my Clearwater, FL Costco is $11.59 for 4- 59 oz containers. Hi! I followed the link from the Costco slow cooker meals. How long do I cook them in the slow cooker? You indicate that this meal is freezer friendly in your meal plan, however you do not indicate if one is to freeze it before or after cooking. I’ve noticed this on other recipes as well. Freeze before cooking in the marinade and then thaw and cook as normal. Just made these tonight, very tasty!! !